OADC PARTNER/SPONSORSHIP OPPORTUNITIES ARE AVAILABLE! Become an OADC Partner so your contact with our members will help improve the overall effectiveness of the civil defense litigation practice and further educate and develop our legal community. OADC values our sponsorship partners. These partnerships allow us to maintain and expand our membership services. 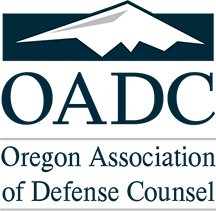 OADC can connect you with attorneys and organizations that are at the forefront of the legal profession in Oregon, while helping you raise your company’s profile and awareness by giving our members further insight into products and services--like yours--which are available to our profession. Increase your reach to key contacts through affiliation with OADC. Obtain direct access to OADC members. Introduce new products and services to key leaders in the profession. Network with the Oregon civil defense community. Achieve public recognition as an organization that’s making a difference in the profession. Click here for more information and a partner sponsorship contract. OADC NEWSLETTER ADVERTISING OPPORTUNITIES ARE AVAILABLE! The OADC Newsletter, The Verdict, is published four times a year for members of OADC. Distribution reaches approximately 1,800 individuals including our attorney members, judges, and insurance industry professionals. A variety of display advertising opportunities are available in the newsletter. For more information and to download an advertising contract, please CLICK HERE.